صفایی موحد, سعید. (1397). الگویی برای برنامه‌ درسی محیط کار بر مبنای رویکرد هیوتاگوژی. مطالعات برنامه درسی, 13(51), 5-26. سعید صفایی موحد. "الگویی برای برنامه‌ درسی محیط کار بر مبنای رویکرد هیوتاگوژی". مطالعات برنامه درسی, 13, 51, 1397, 5-26. صفایی موحد, سعید. (1397). 'الگویی برای برنامه‌ درسی محیط کار بر مبنای رویکرد هیوتاگوژی', مطالعات برنامه درسی, 13(51), pp. 5-26. صفایی موحد, سعید. الگویی برای برنامه‌ درسی محیط کار بر مبنای رویکرد هیوتاگوژی. مطالعات برنامه درسی, 1397; 13(51): 5-26. 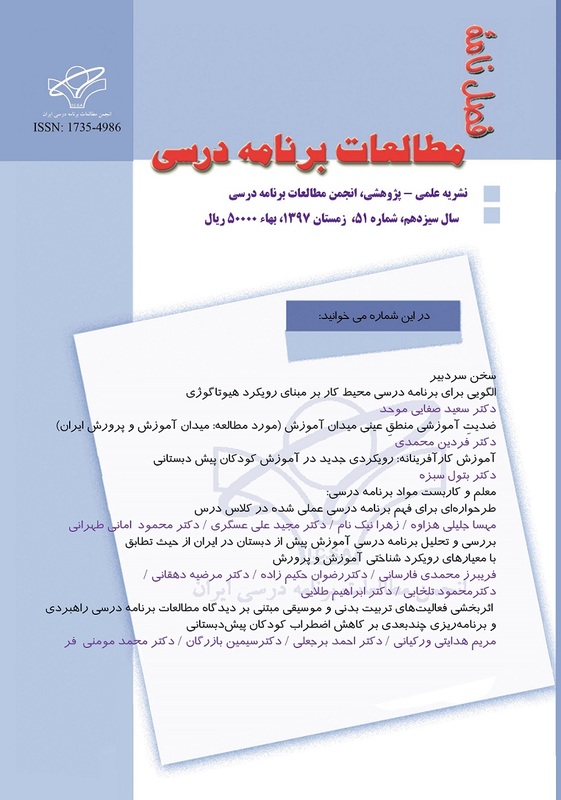 دگردیسی جامعه صنعتی به جامعه اطلاعاتی از دهه 1970 و به تبع آن ظهور و توسعه سازمان های دانش بنیان موجب شد تا سازمان‌ها و محیط‌های کار به عنوان عرصه‌هایی ارزشمند برای یادگیری و توسعه کارکنان به رسمیت شناخته شوند. بر همین اساس امروزه عناوینی چون "یادگیری محیط کار" و "برنامه درسی محیط کار" واژه‌های چندان غریبی محسوب نشده و نمایانگر پژوهش‌های گسترده‌ای هستند که ابعاد مختلف یادگیری در سازمان‌ها را مورد واکاوی قرار داده‌اند. این مقاله با درک اهمیت محیط کار به عنوان زمینه‌ای ارزشمند جهت یادگیری و توسعه، تلاش دارد تا بر مبنای رویکرد هیوتاگوژی (یادگیری خودفرمانگر) الگویی را جهت برنامه‌ریزی درسی در محیط کار عرضه دارد. پژوهش حاضر را از حیث روش شناختی می‌توان در زمره "پژوهش‌های نظریه‌ای" در حوزه مطالعات برنامه درسی محسوب نمود که هدف آن ارائه الگوئی نو در این حوزه می‌باشد. برای اعتباربخشی الگو سعی شده است از نظرات خبرگان این عرصه بهره‌برداری شده و در عین حال عناصر الگو به طور دقیق با مبانی نظری، مفروضه‌ها و اصول ادعایی انطباق داده شوند. به طور خلاصه مولفه های اصلی این الگو عبارتند از: تحلیل چهارسطحی(S3M Analysis) یا آگاهی محیطی، هدف گذاری سه سطحی(SPL)، خودآگاهی، تدوین فرصت های یادگیری چهارگانه(AVST)، و ارزشیابی توانمندساز. این مولفه ها تحت یک چتر سه عنصری(همگویی، همکاری، همفکری) اجرا می شوند. Belfiore, Mary Ellen (1996). Understanding Curriculum Development in the Workplace: A Resource for Educators. ABC Canada. Billett, Stephen (2002), Toward workplace pedagogy: guidance, participation and engagement. Adult Education Quarterly, vol. 53, No. 1, 27-43. Billett, Stephen (2001). Learning in the workplace: strategies for effective practice. ALLEN & UNWIN, Crows Nest, Australia. Billett, Stephen (1996). Towards a model of workplace learning: the learning curriculum. Studies in Continuing Education. vol 18 (1) pp. 43-58. Billett, Stephen (1995). Workplace learning: its potential and limitations. Education and Training, 31 (4), 20-27. Blaschke Lisa Marie and Hase, Stewart (2016). Heutagogy: A Holistic Framework for Creating Twenty-first Century Self-determined Learners. In Gros B., and Kiushuk Maina M. (Eds). The future of ubiquitous learning. Lecture Notes in Educational Technology, Springer, Berlin, Heidelberg. Conner, Marcia L. (2004). Learn More Now. Hoboken, NJ; John Wiley & Sons. Dunning, Donna (2008). Learning Style. In Encyclopedia of Educational Psychology. SAGE Publications. Eisner, Elliot W. (2002). The Educational Imagination; On the Design and Evaluation of School Programs, Merril Prentice Hall, New Jersey, USA. Groves, Richard W. and Short, Edmond C. (1991). Theoretical Inquiry: Components and Structure. In Forms of Curriculum Inquiry. Edmond C. short (Ed). State University of New York press, USA. Hase, Stewart & Kenyon, Chris (2001). Moving from androgogy to heutagogy in vocational education. In: Research to Reality: Putting VET Research to Work. Proceedings of the Australian Vocational Education and Training Research Association (AVETRA) conference. Adelaide, Australia. Hase, Stewart and Kenyon, Chris (2000). From Andragogy to Heutagogy. In ulti BASE In-site, Melborne: RMIT. Jarvis, Mary I. (1997). Initial Consideration for Developing Workplace Curriculurm (based on whole language concepts). Hase, Stewart and Kenyon, Chris (2007). Heutagogy: a child of complexity theory. Complicity: An International Journal of Complexity and Education. Volume 4, No 1, pp. 111-118. Hase, Stewart (2011). Learner defined curriculum; heutagogy and action learning in vocational learning. Southern Institute of Technology Journal of Applied Research. 9 (1), 87-92. Hase, Stewart and Kenyon, Chris (2001). Moving from and andragogy to heutagogy: implications for VET. In Proceedings of Research to Reality: Putting VET Research to Work; Australian Vocational Education and Training Research Association (AVETRA). Adelaide, SA, 28-30, March, AVETRA, Crows Nest, NSW. Hase, Stewart and Kenyon, Chris (2003). Heutagogy and developing capable people and capable workplaces: strategies for dealing with complexity. Proceedings of the Changing Face of Work and Learning Conference, Alberta, Canada, 25-27, September, University of Alberta, Alberta, Canada. Hase, Stewart; Tay, Boon Hou; Goh, E (2006). Developing learner capablity through action research: from pedogogy to heutagogy in the workplace. Proceedings of Globar VET, Challenges at the Global, National and Local Levels: Australian Vocational Education and Training Association (AVETRA) Conference, Wollongong, NSW, 19-21 April. Hase, Stewart and Kenyon, Chris (2013). Self-Determined Learning: Heutagogy in Action. Bloomsbury Publishing plc, New York. USA. Mathews, Pamela (1999). Workplace learning developing: a holistic model. The Learning Organization. Volume 6. Number 1. pp. 18-29. Narayan, Vickel and Herrington, Jan (2014). Towards a theoretical mobile heutagogy framework. Rhetoric and Reality, pp. 150-160. Schon, Donald A. (1984). The Reflective Practitioner: How Professional Think in Action. Basic Books, New York, USA. Utech, Jenny Utech (2008). Contextualized curriculum for workplace education: An introductory guide. Massachusetts Department of Elementary and Secondary Education. Vaughan, Karen (2008). Workplace learning: a literature review. Competenz, New Zealand.